A day at the playground. It’s a summertime rite for almost every American child and most of us have endearing childhood memories of days spent sliding, swinging and see-sawing our way to simple happiness. Unfortunately, the neighborhood park’s playground is also where many kids are injured, sometimes seriously. Though childhood injuries are bound to happen, and most don’t even warrant a trip to the doctor, the fact is that more than 200,000 children, below the age of 14, are sent to the emergency room every year due to injuries sustained at the playground, according to the Centers for Disease Control and Prevention. Fortunately, there are a number of steps you can take as a parent, or daycare worker, to help prevent injury to children. Because adults are the biggest factor regarding childhood health and safety, it is our responsibility to always be vigilant towards prevention in order to ensure that they remain injury-free. Make sure that you can observe your children at all times, regardless of where they are playing. Check for hazards that compromise safe play such as broken glass or other potentially-dangerous objects. Analyze that the surfaces under all play equipment is safe and meant to lessen the blow if a child should fall. Whether the surface is mulch, sand or rubber padding, it should be thick enough to absorb shock and is applied under all areas of play. Make sure that the equipment itself is in good shape. Look for rusted or exposed nails and screws and that all plastics are solid and free of cracks or holes. Double check any metal surfaces to ensure that the temperature of such is not hot enough to cause burns. 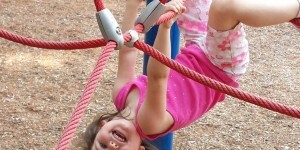 Many playgrounds create age-appropriate play areas to help lessen the chances of injury to smaller children. Make sure that your child, either younger or older, is playing in the areas that are appropriate for them. Keep small children off of slides higher than four feet and from climbing on equipment that is comprised of ropes or chains. Look for low platforms and short ladders and ramps for your little adventurers. Most playground injuries happen when adult supervision is lacking. Make sure to always be vigilant when kids are around to ensure the safety of all of them. Talk with parents and split up to cover different areas of the playground so that no area is uncovered. Discuss with your kids, before each visit, the rules and expectations of their playground behavior. Daycare and preschool representatives should have posted guidelines in classrooms and facility bulletin boards to ensure compliance to safety measures. At Foundations For Learning, we believe in offering programs and developmentally-appropriate curriculum while striving to enhance social, emotional, physical and intellectual growth in young children. And safe playtime is conducive to that mission. By helping to ensure your child’s safety while at preschool and at home, we strive to create happy, fun-filled memories for your child and you as a parent.